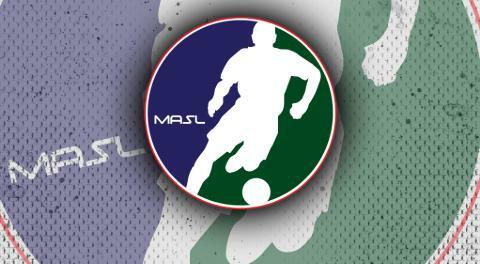 KANSAS CITY (Jan. 23, 2019) –The Major Arena Soccer League (MASL) Week Eight Team of the Week was announced this morning. Diego Arriaga (RGV Barracudas) – Arriaga was a brick wall for the MASL’s stingiest defense this weekend. In only his third start, Arriaga faced a barrage of shots from last season’s Ron Newman Cup Finalists. He stood tall throughout the match, earning .880 save percentage with 22 saves on 25 shots, as the Barracudas earned their third straight win. James Togbah (Kansas City Comets) – Togbah has no signs of a sophomore slump in his second season with the Comets. Although his side wasn’t able to find a win on Friday against the Ambush, Togbah did his part contributing two assists. Then on Sunday against Utica City FC, Togbah took care of business. He scored three goals and an assist to lead his team to a win. Douglas Dos Santos (St Louis Ambush) – The Ambush earned another win against their cross-state rivals on Friday with superior defense. Dos Santos provided three blocks on the defensive side, then added two goals and an assist. 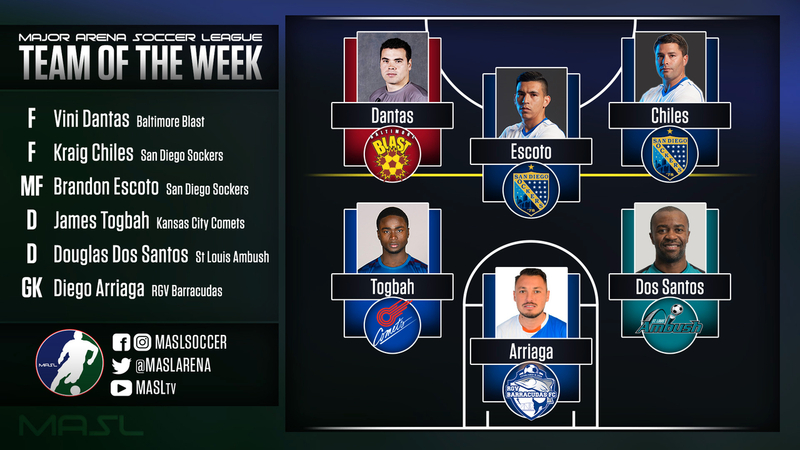 Brandon Escoto (San Diego Sockers) – Brandon Escoto helped his Sockers to another two-win weekend against two Pacific Division Rivals. Traveling to Tacoma on Friday, Escoto notched an assist to go with his first hat trick of the season, then followed it up with a two-goal, one-assist effort at home on Sunday. Vini Dantas (Baltimore Blast) – The Blast extended their home unbeaten streak behind the strength of Dantas. The veteran forward took care of business with a hat trick in both games this weekend. Kraig Chiles (San Diego Sockers) – Chiles and the Sockers extended their lead in the Pacific Division with 2 wins over the weekend. Chiles was crucial to both wins, netting four goals and an assist over the two games.